This magnificent villa was built by the owner's husband - a local craftsman - Styled on a Typical Andalucian Cortijo with meticulous attention to detail and original hand renovated furniture. Snuggling in the foothills of The Sierra Almijara National Park it is located on a quiet local road via a 50 metre concrete drive. Approx 20 mins walk down to the beautifully conserved, award winning, whitewashed Andalucian village of Frigiliana with stunning views of the mountains and down the Frigiliana valley to the sea. Accommodation consists of one double and one twin bedroom, living room with beamed ceiling, SAT-TV, wood burning stove & rustic kitchen. All rooms have A/C + central heating. outside are two shady porches, wooded walk to shaded copse reading area, Outdoor Kitchen with BBQ, fridge, dining facilities overlooking the pool. The busy resort town of Nerja, nightlife and eight beaches are short drive away, superb walking from right outside the villa. With FREE Wi-Fi INTERNET ACCESS. The Villa is Fully Registered and Licensed by the Andalucian Rural Tourism Authority ( License number RTA/ CR/ MA / 00574 ) which is now a legal requirement for all Rural Property Rentals - Un registered properties run the risk of being Closed Down and Sanctioned by the Tourism Authority Thus Jeapordising the holidays of unsuspecting guests. However licensed Properties such as Villa Fuente Santa are Subject to stringent periodic inspections and strict quality controls which ensure that we adhere to and provide the highest standards of Accomodation, Facilities and Service. Flexible arrival / departure :- we want our guests to get the best possible value for money, and we realize that many flight prices are much cheaper during the week rather than at weekends. So we are pleased to offer the flexibility of midweek arrivals and departures and we will always be available to meet you personally at the villa whatever time you arrive. Outside the villa - by the pool we have a fully fitted out door kitchen shaded by a brushwood roof, with BBQ, refrigerator (keep those drinks cool), sink, breakfast bar style dining area with stools, and a full set of shatter-proof crockery. 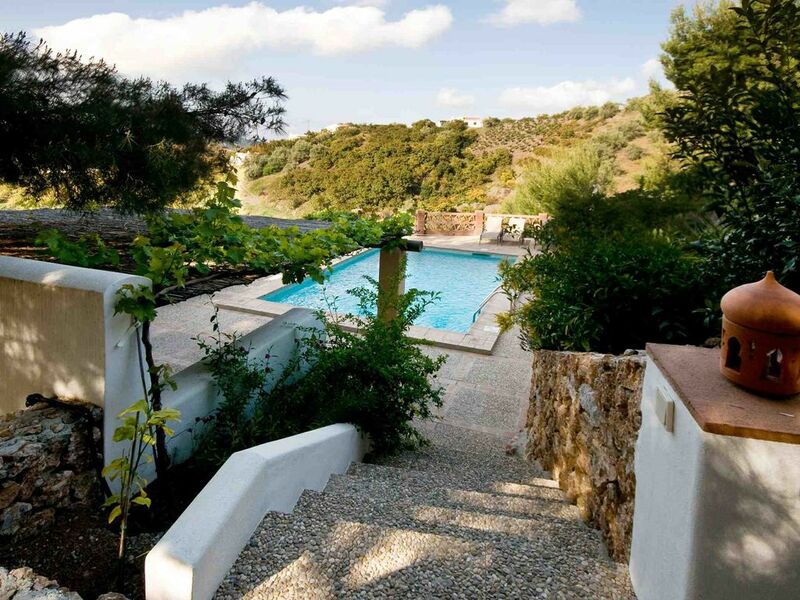 -- surrounding the villa on two sides are large shady covered porches, with more seating / dining space and which give magnificent views over the pool and down past Frigiliana to the sea. A wooded path of about 100 metres wends across the hillside to quiet area shaded by a tall pine tree with rustic stone seating and wrought iron table which is an ideal spot to cool down and write the postcards in peace or sit with your favourite book out of the heat. Internet Access -	The Villa is equipped with free WiFi – However we strongly recommend that if you envisage using our WiFi system for business purposes or any other critical function that you ensure that you have a secondary source in case of any malfunction of the network. We offer WiFi Internet Access as a complimentary “Value Add” service to our guests. However we provide no technical support, nor do we accept any liability, nor will we offer any compensation, for the non functionality of the service for whatever reason. A little bit about us: Villa Fuente Santa was built by Jose a respected local Artisan, and lovingly decorated and furnished by his wife the owner Carmen in authentic Arabe-Andalucian style she also restored by hand many original pieces.Our local area guide will ensure that you have all the information you need about the Villa and the area and its attractions no matter what kind of holiday you prefer. If all else fails, we are always only a phone call away. We take great pride in the fact that you entrust us with such a precious commodity as your holiday. It is our personal goal to ensure that every possible comfort and amenity is provided during your stay. In 2012 Villa Fuente Santa was chosen to feature in the 'IKEA Life Style “ Magazine for summer 2012 from thousands of Villas in Spain featuring Carmen and Jose enjoying life in their beautiful home. If you click on the link below ( or cut and paste it into your web browser ) you can see the feature including a short video of the Fiesta we had during the Ikea Photo Shoot. The local area: Frigiliana is a charming Andalucian village Known as the Pearl of Axarquia whose Moorish architecture dates back 5000 years, nestled into the foothills of the Almijara Mountains at the edge of the Sierra Tejada National Park. The older part is a mass of narrow flower laden cobbled streets winding up the hillside with wonderful views over orchards and the coast to the South and Spectacular views of the National Park North and East across the magnificent Higueron Gorge. With something for everyone Frigiliana is a paradise. For walkers and mountain bikers with enchanting walks and rides for all abilities starting right in the village. For historians and cultural the Moorish past remains visible today. For the beach lover Nerja is a busy seaside town five minutes drive away, set amidst cliffs overlooking rocky coves with many fine beaches and all the usual facilities of a Mediterranean holiday resort, while retaining the qualities of a typical Spanish small town. Day trips and a bit further afield : Within a short drive are several whitewashed mountain villages each with their own charm and many like Competa and Algaborro are on the famous “Ruta de Vino” (wine route) The awe inspiring Nerja Caves, are a fascinating, network of cathedral like underground caverns with the World's biggest stalactites. Maro,is a picturesque village with panoramic views across the sea and a small secluded beach. A little further along the coast are La Herradura and Almunecar, while further afield is the historic city of Grenada with its famous Alhambra Palace (pre-booking advised). Mijas, Antequara El Torcal National Park, Marbella, Seville, Gibraltar, Ronda, Cordoba, and other famous Costa del Sol resorts are all accessible for day trips. Hello / Buenas Dias, I am Carmen Munoz and I am the lucky owner of Villa Fuente Santa - I was born and still live in Nerja which is a pretty little seaside town on the coast about nine Km south from Villa Fuente Santa. I enjoy being able to share my lovely house with people from all over the world and because I personally manage, clean and maintain the property I feel I can offer a much more personalised service to my guests. My hobbies and interests include - Walking in the local mountains, Taking part in all the traditional local festivals, looking after my gardens in the villa, and sewing and dress making but my real love is restauration of old furniture, and in and around the Villa you will see many items of furniture that I have brought back to life. Villa Fuente Santa has a very special place in my heart because I was one half of the team that actually built the Villa. After having dedicated many years to building beautiful High Quality and highly sought after traditional Spanish Homes in the local area, we decided to build one for ourselves with a view to it becoming our retirement home. But as often happens things dont always go to plan and life circumstaces change, which is why I am now proud to be able to share my little piece of paradise. The centrally situated bathroom has a huge one and a half metre wide walk in shower, WC and feature washbasin. Outside we also have a shower by the pool. The Main house is wheelchair accessible however there are steps down to the pool which may be a problem for some wheelchair users. The rent includes water, and electricity, bed linen and towels (except beach towels). Arrival / departure days are flexible all year round as we understand that mid week flights are much more economical. Arrival time 16.00; departure time no later than 10.00 am to allow for cleaning and preparation for arrivals though where possible we will always try to accommodate late departures / early arrivals. Change of linen and towels is done on the 7th day then weekly. Extra days at pro-rata cost. Discounted rates for long lets, low season, four weeks or longer when electricity is included and additional gas is purchased as needed. Child's high chair and cot can be provided. Boz was right on time to meet us and guide us to the house. When we arrived the views were breathtaking and we really appreciated the amount of privacy there is on this property. During our stay, we had a clogged drain which Boz had taken care of very quickly. Prior to our arrival, Boz and Polly were extremely helpful and professional in providing information about restaurants and places to go. We had a wonder and relaxing time at Casa Fuente. We highly recommend it and will definitely plan to return. We are so pleased you enjoyed your stay in Carmens villa, she works hard to make sure all our Guests enjoy their stay there. We are happy that you found our local tips and information helpful. We pride ourselves, should there be a problem at the villa (in your case a blocked sink) that we deal with it as best and as quickly as we are able to . Never tried Kumquat Tea, but will try it now !